When I was growing up, one of my favorite foods was baked potatoes. We would load it up with sour cream, green onion, and homemade bacon bits. Nowadays, I’ve been drawn to baking sweet potatoes instead. Here are some reasons why you should make the switch too! Rich source of nutrients and antioxidants: They are a good source of potassium, fiber, niacin, vitamin B1, vitamin B2, and phosphorus. As a result of its high beta-carotene content, sweet potatoes are rich in free-radical fighting antioxidants. Anti-inflammatory and anti-cancer: Studies have found that its unique colour-based phytonutrients give sweet potatoes anti-inflammatory and anti-cancer properties. Regulate blood sugar level: One of the most interesting health benefits of sweet potatoes is its ability to regulate your blood sugar. Despite their sweet taste, they’re considered lower than regular potatoes on the glycemic index. This means the natural sugars in sweet potatoes are released slower, preventing your sugar from spiking. Regulates insulin metabolism: A medium-sized sweet potato contains 6.6 grams of dietary fiber that is instrumental in reducing your cholesterol and controlling your blood sugar. Research has found that extracts derived from sweet potatoes can increase your blood’s levels of the protein hormone adiponectin. When someone is low in adiponectin, they tend to have low insulin sensitivity. Adiponectin works to regulate your body’s insulin metabolizing processes. Baking sweet potatoes is as simple as baking regular potatoes, but provides many more health benefits. Rather than making the regular French fries, try preparing your sweet potatoes with this food hack that is simple and sharable! When you bake your potatoes hasselback-style, the skin comes out French fry crispy while the inside comes out soft. 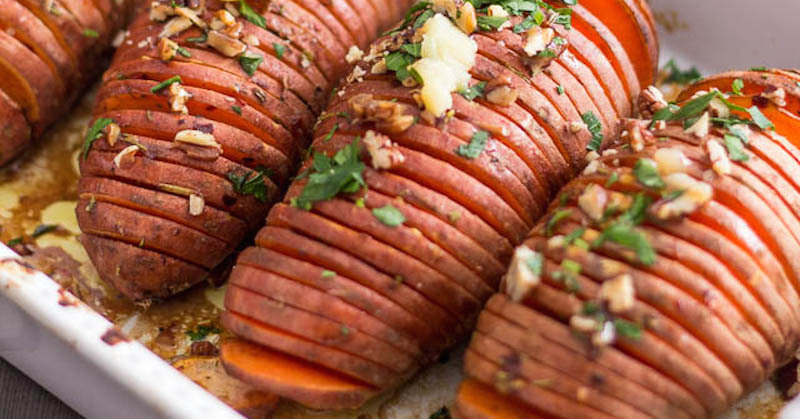 The best part about preparing hasselback sweet potatoes is being able to load them with herbs, and any of your favorite toppings! Preheat the oven to 425 degrees F. Line a baking tray with parchment paper. 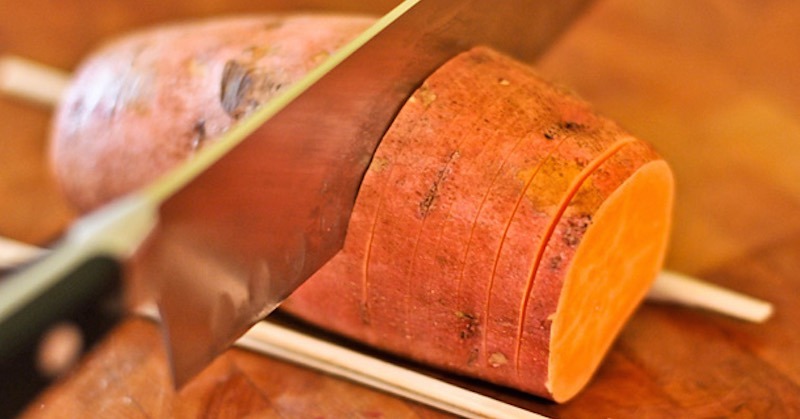 Make a series of ¼-inch slices along 4 medium-sized sweet potatoes, slicing 2/3 of the way through (see tip above). Rub the potatoes all over with the mixture, getting in between the slices. Place on the baking sheet and roast until the center of the potatoes are tender and the outside is crisp, approximately 50-60 minutes. Halfway through the roasting time, remove the potatoes from the oven and run a fork gently across the tops of the potatoes, using light pressure, to fan the slices and separate them from one another. Meanwhile, mix: 3 tablespoons of Greek yogurt and chopped scallions with a pinch seasalt and a pinch of pepper. Serve this sauce with the potatoes. Now you have a new way to eat sweet potatoes, try it! I’m sure you will love it!